The Windy 9 hits the road! Staff from the Athens County Convention and Visitors Bureau are hitting the road to share info about Ohio’s Windy 9. 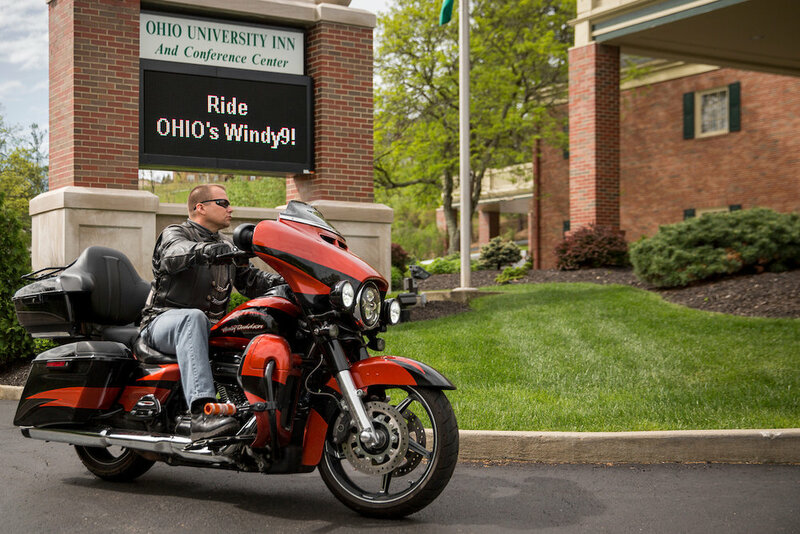 Join us at the following Progressive® International Motorcycle Shows® to hear about the Windy 9, places to stay in Athens, Ohio and much more. Get your map and get on the road! Find us at the shows, mention you saw this and we’ll give you a free Ohio’s Windy 9 patch*, as shown above just for stopping by! For a sneak peak of Ohio’s Windy 9, check out the video below! The rolling hills of Southeast Ohio are where I call home, not by birth but by choice. So, it is no surprise that I savor the opportunity to step outside my front door and explore the beauty that daily surrounds me. It would seem that every twist and turn in the road leads to somewhere new. It’s a journey that often leads me to a captivating story, a scenic snapshot, a mouthwatering treat and sometimes even a charming new friend. Anyone can choose to step outside and discover this beautiful region. There are a variety of exciting ways to do so. But my option of choice to explore the area is via the Windy 9 motorcycle trails. 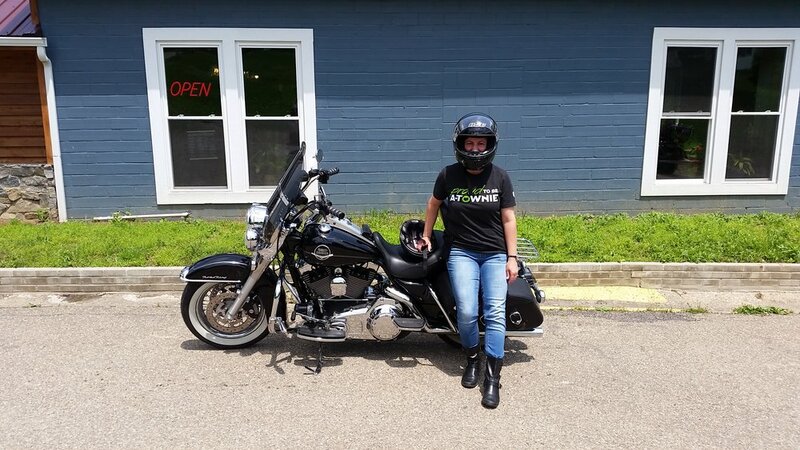 There is undeniably nothing quite like strapping on my helmet, hopping behind my husband on our Harley Davidson Road King Classic, and hitting the open highway. I am often asked if I would prefer to have a motorcycle myself, rather than be a passenger on his. My answer is quick and sure - no. Here’s why. I have explored many miles on the back of his motorcycle and saw sights I would have never seen had I needed to keep my eyes on the road ahead. There is simply something amazing about being in the moment, looking to the left and right, and allowing myself to be immersed in the beauty of it. And in this part of the state, beauty abounds! Recently I had one of those Harley rides, one of those opportunities to soak up the scenic surroundings with my husband and best friend. Since we live locally, it is easy to decide last minute to ride portions of the Windy 9 routes for the afternoon. This particular summer Saturday was too gorgeous to pass up. And we did not do it alone. Here’s the deal. It is often assumed that the Windy 9 motorcycle trails are meant to be enjoyed solely on a bike. Sure, they are perfect for your favorite ride, but in all honesty; the scenery can equally be enjoyed via car. So, our teenage children hopped in the car, and followed behind for the midafternoon drive. We hit scenic highway 550 out of Athens and headed northeast. It truly was the perfect July afternoon. Patriotic bunting and flags waved from farmhouse porches in the summer breeze. Fluffy white clouds drifted over rolling hillsides. And as we slowly rounded bends in the road, captivating scene after scene unfolded before us. Beautiful barns, both old and new, speckled the landscape. Country churches, with flowerboxes overflowing with petunias, sat adjacent the roadside. And with the luxury of a passenger rider, I had the occasion to glimpse a Volkswagon Bug half buried in the middle of a farmer’s field, sure that I would have missed that serendipity had I had my eyes on the road. 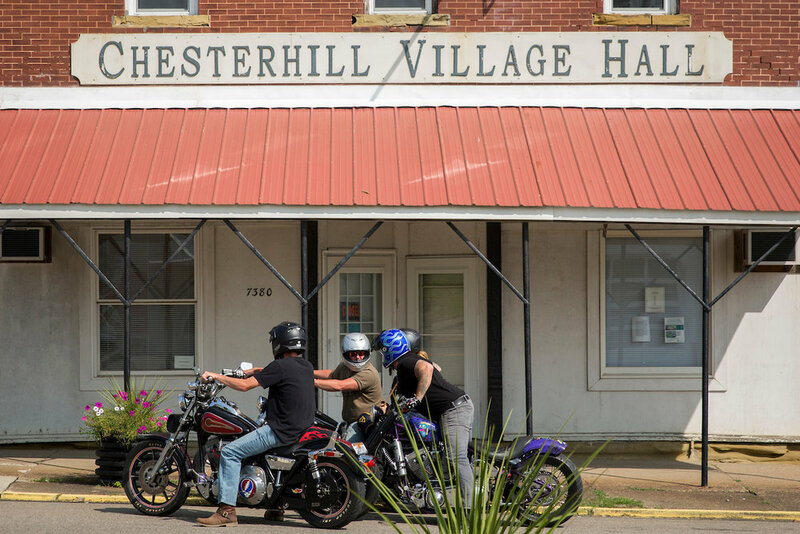 We rode for approximately 45 minutes, switching from 550 to 377, before entering the town of Chesterhill, Ohio. 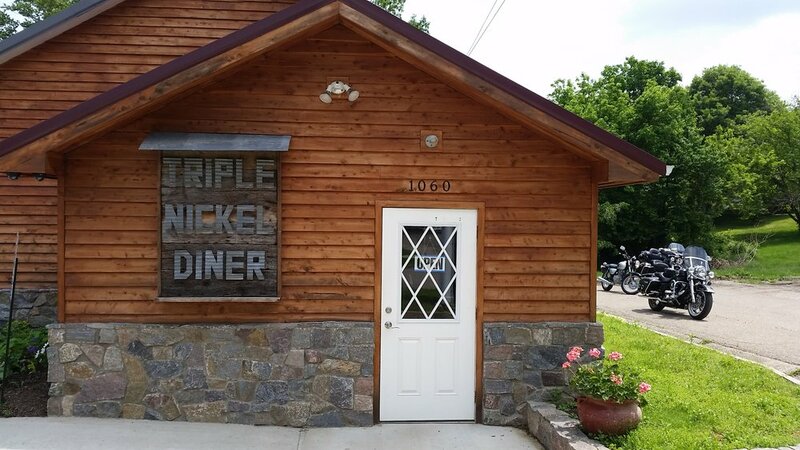 It’s here that we found the perfect stop over and turn around spot – the Triple Nickle Diner. If you are not careful you might blink and ride right past, though you would miss out if you did. We dined on delicious locally raised bison burgers and fresh cut fries. 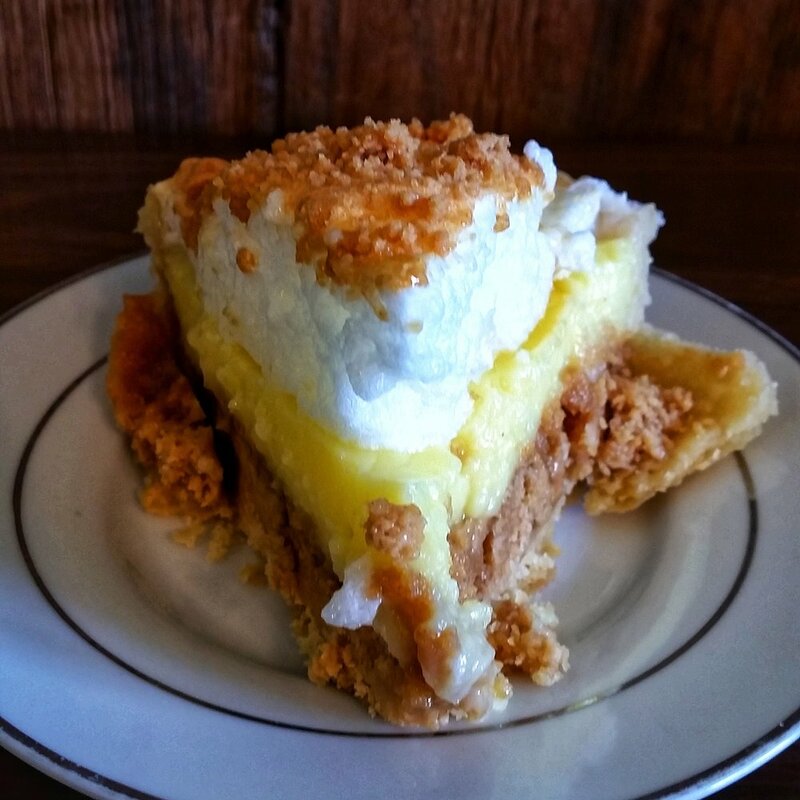 For dessert, we delighted in mouthwatering peanut butter pie. As a family, we decided this jaunt and pit stop needed to be an annual summer outing. It was frankly too tasty to not enjoy again! Our ride back to Athens was just as scenic with a jaunt off of 550 to 329, taking us through Stewart and over to State Route 50. I soaked up the view, making sure to point out to our kids in the car behind us the two deer running past cows in a field, all while an impressive hawk flew overhead. Often we need an excuse to hit the pause button on our crazy, busy lives and savor the little moments. This is one of the beautiful traits of the Windy 9 – the ability to breathe in the beauty of the scenic countryside as well as relish the priceless memories to be made along the way. Personally, I know we will get back on two wheels again soon, taking in another one of the Windy 9 routes. And we will cherish every memorable moment made together…because life is too short and too valuable to do otherwise. Blog and photos by Tania Meek. Summer is here in Athens County, Ohio and motorcyclists are ready to ride. Beautiful days and warm temperatures bring out the bikes! 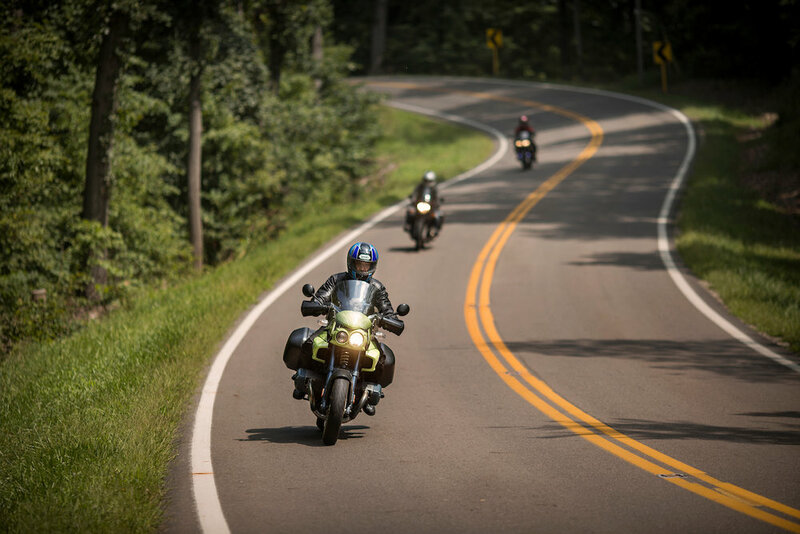 The Rim of the World Route on Ohio’s Windy 9 is a favorite of many riders. The Rim delivers historic sights, a couple state parks, great scenery, along with the curves you crave. Spring wildflowers and brilliant autumn colors make this route especially popular during these seasons. You can begin the route from East State Street to access State Route 33. Turn left onto State Route 690, and you will encounter a two-lane country road with rolling hills along the way. The Dogwood and Red Bud Trees are in bloom showing themselves off! 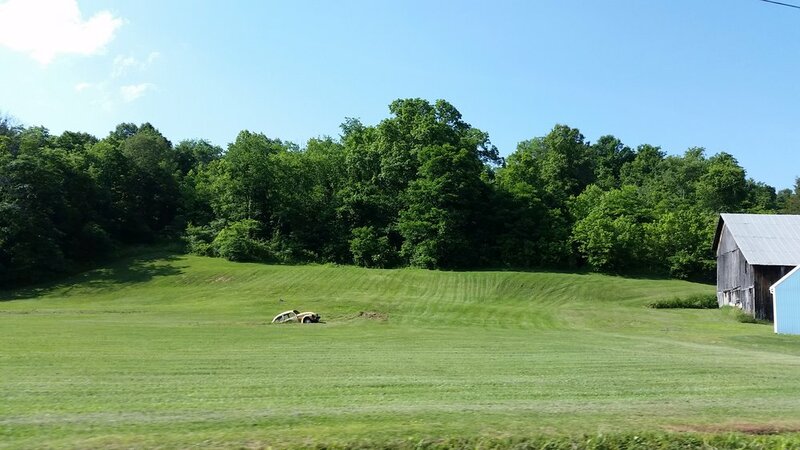 Completing a right turn onto State Route 550, you you’ll be riding by some of Athens County’s many farms. You’ll find fresh corn, tomatoes, cucumbers and other fruits and vegetables to devour at roadside stands, the local farmer’s markets and the Chesterhill Produce Auction. Moving towards State Route 377, you might mistake the scenery for Amish Country, thinking you are riding somewhere in Pennsylvania or Kentucky instead of Southern Ohio. Breathe in that fresh country air as you enter Chesterhill, home of the delicious Triple Nickel Diner. 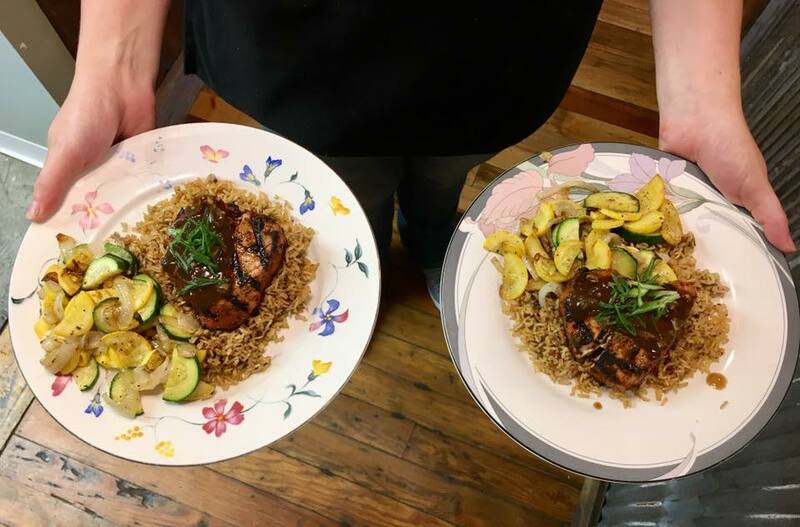 Feel the warmth and small-town atmosphere as you are greeted by one of the co-owners or their friendly wait staff. The diner sources local ingredients for their out of this world dishes. Be amazed if you take a slight detour off of State Route 377 onto Lick Run Road just past a little town called Todds. Look to the right to see a house that has gourd bird houses hanging in all different shapes and sizes. Gourd birdhouses in Todds, Ohio. Leaving there, go straight crossing over State Route 377 to State Route 266, be sure to make a quick stop at the Stockport Mill; the last hand-operated lock in the USA. Traveling over the bridge of the Muskingum River towards State Route 60 is a beautiful sight. Head through the town of McConnelsville and cross a narrow old steel bridge. To the immediate right is the River Queen Tavern. It’s a great place to stretch your legs and grab some food. Sit outside on the back deck and see a boat or two or just enjoy the atmosphere! After your break, climb back on your bike and head onto St. Rt. 78. This part of riding The Rim delivers exciting curves and turns that will thrill you as you travel back to Athens. 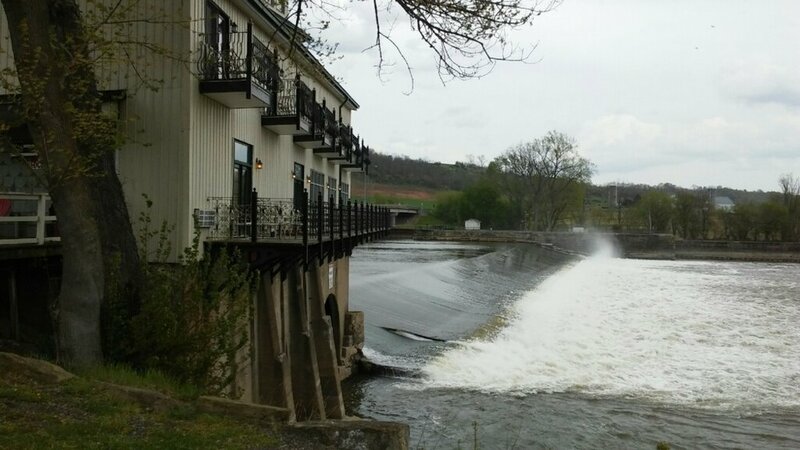 The Muskingum River flowing next to the Stockport Mill Inn. Park the bike for the night at one our our hotels, motels, B&Bs or cabins. Athens is known for its wonderful restaurants, breweries, and live entertainment. Plenty of fun to have during your stay! The next day, wake up to plan your next Ohio’s Windy 9 route! The Ohio University Inn is conveniently located in Athens. Wonderful scenic views await you in Southeast Ohio on Ohio’s Windy 9. Get the map and get on the road!